Home › Uncategorized › Are the fires in Redding a sign of God’s judgement on Bethel? A brief post from Rick Becker of “Famine In The Land”, addressing the speculation concerning the reason for the fires fast approaching Redding, California – home place of Bill Johnson’s Bethel Church. The Carr fire that has caused devastation in California, has weaved its way into Redding, home of Bethel church. Hundreds of homes have been destroyed, and at the time of this writing two lives have been lost. This tragedy comes shortly after the horrific fires in Greece that took the lives of at least sixty people. Across the world, other tragedies are taking place in the form of other natural disasters, wars, disease, and starvation. 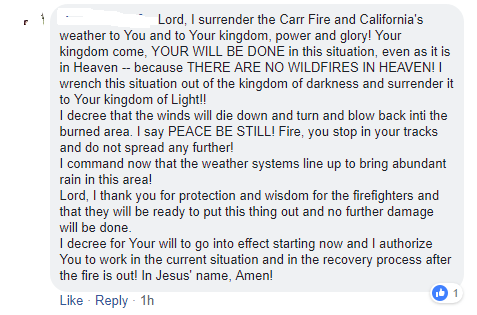 The Carr fire has captured the attention of those familiar with the New Apostolic Reformation (NAR) due to one of the chief proponents of NAR false doctrines being Bethel church. In this brief post, I would like to address the speculation concerning the reason for the fire. ‹ NAR recognize Bill Johnson & Randy Clark as their own apostles (Part 1).